Here in Tacoma, the daffodils have been blooming for a while now; I got a lot of mileage out of this fact when I was back in Michigan, where the bitter cold on my legs brought back memories of ten years of winters that just refused to turn lamb-like. I’d get asked “So what’s it like out there?” A smug “well, the daffodils are already blooming” seldom failed to put an adorable look of hopelessness on the face of my winter-worn questioner. This is, certainly, the flip side of being teased for the endless rain. I bought a bunch of ten daffodils from the store the other day, when they hadn’t even started to think about opening yet and you could just barely see a touch of yellow at the ends. Now, they look like this – brilliant orange and yellow. You know me, I can’t see such a pretty image without wanting to make a skirt out of it. I’ve included some bonus crocuses, too. I don’t really do fairies very much; I have no shame about spending my time making up all kinds of mermaid tails and stories, but fairies bore me in much the same way blue jeans and real royalty bore me. But really, who else would wear this dress? 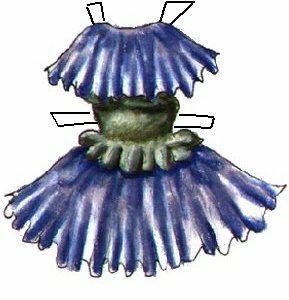 Now, back when I was drawing clothes for the Boutique, I worked out a way to make separate fairy wings, through some system of cutting a slit in the doll’s chest and poking a tab through. I think sometimes I should sort that out again, but I draw fairy outfits so seldom that it always sinks back down to the bottom of the pool of things on my mind at any given moment. Let’s have a new contest… The winner gets to tell me how to color one of my black-and-white dresses, as usual! Today is sort of a guest post! 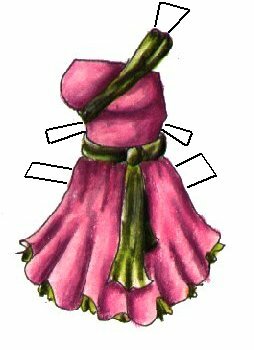 My cousin Becky and I, as I mentioned a couple days before, drew some paperdolls together – she did two, and this is one of them. I love the way the yellow makes the petal skirt look so vibrant, and the detail on the corset top. Yep, my family is cool! Someday I’ll have a paperdoll jam session with my mom, too. Becky loves her beautiful dresses too, as you see if you look around her deviantart gallery. This one is my favorite, with the gauzy layer on the skirt done so nicely (and the guy’s cloak! Unlike me she can actually draw men) The advantage of paperdolls over everything else, though, is that all I really care about is the outfits! 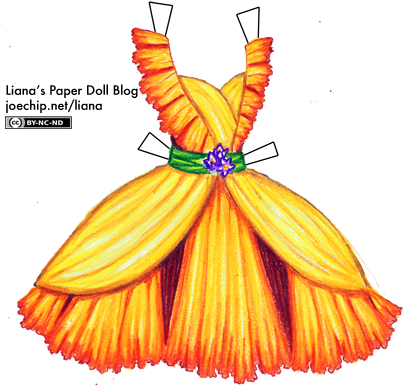 Yep, paperdolls are a superior art form… haha, OK, maybe just for me. On the good side, I got a new pencil sharpener; its box promises an “extra heavy duty motor” and indicates that it is designed for “continuous” use. Which is good, because I subject my poor sharpeners to some sad conditions… Anyways, today I got started too late and wasn’t feeling inspired at all, so here are two fairy dresses from the old Boutique. So for some reason one of my most popular keywords these days is “printable paper dolls deadly night shade.” Hello out there, whoever it is who wants a nightshade paper doll! I hope you enjoy this one. 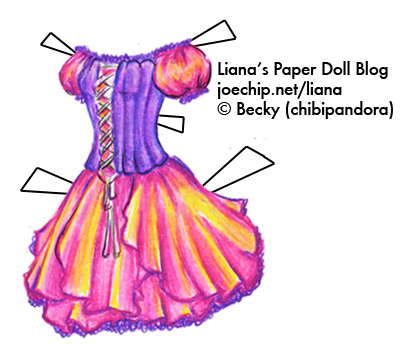 This fairy is a lackey for the Fairy of Malice, who you can see if you check out my old paper doll page and scroll a bit. And, I think, she also should make those of you who voted for skimpy costumes happy, and those of you who actually cut these paperdolls out sad, because I can’t imagine this being very easy to cut out!